Stairway to heaven – microBEnet: the microbiology of the Built Environment network. Here is another nice paper about microbes degrading human buildings. I guess I am just fascinated by that topic! No matter what we build, microbes will find a way in or on, and will start chewing on things. 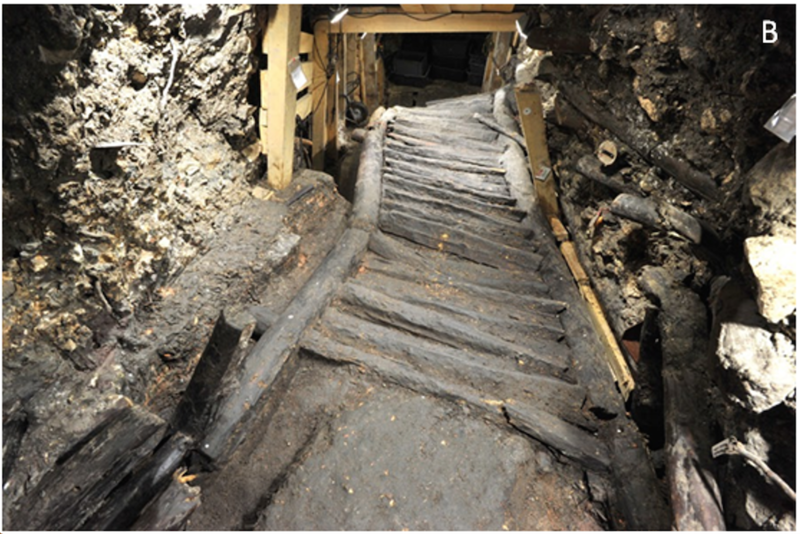 This paper by a group of Austrian researchers came out a couple of days ago in PLOS ONE, and describes how microbes were threatening to eat up a very old wooden staircase. Hallstatt, a UNESCO World Cultural Heritage site, is one of the most important archaeological sites in Austria, containing many excavations from the Bronze Age. Since prehistoric times, this area is known for salt mining. From local burial sites it is known that people who lived here were wealthy, and the salt in the old mines has preserved many of the ancient organic artefacts, such as shoes, clothing and tools, including wooden and leather backpacks. One of the great findings in Hallstatt’s prehistoric mines is a wooden staircase, built arond 1100 BC. It was discovered in 2004, and is believed to be the oldest known staircase in Europe. To preserve the staircase from earth movements in this area, it was carefully disassembled and brought to the Museum of Natural History in Vienna in 2014, where it was thoroughly analyzed by biologists and chemists. In 2015, it was brought back to Hallstatt and is now on display within the “show-mine“. The 3100 years old staircase is 8 m long and 1.20 wide, and is representative of the construction typical of the Bronze Age. Like with many other artefacts from this site, the salty environment in the mines was thought to have preserved microbial growth on the staircase. But as soon as the staircase was moved to Vienna, fungi started to grow on the wood despite attempts to preserve it. To investigate the composition of the microorganisms growing on the wood, samples were collected at the Vienna museum using non-invasive contact plates and a-bit-invasive scrapings of the visible mycelia and dark spots. Fungi and bacteria were cultured on a range of different media with variable amounts of salt. Cultured strains were genotyped by amplification and sequencing of the ribosomal ITS region and cellobiohydrolase genes (fungi), or 16S rRNA genes (bacteria). 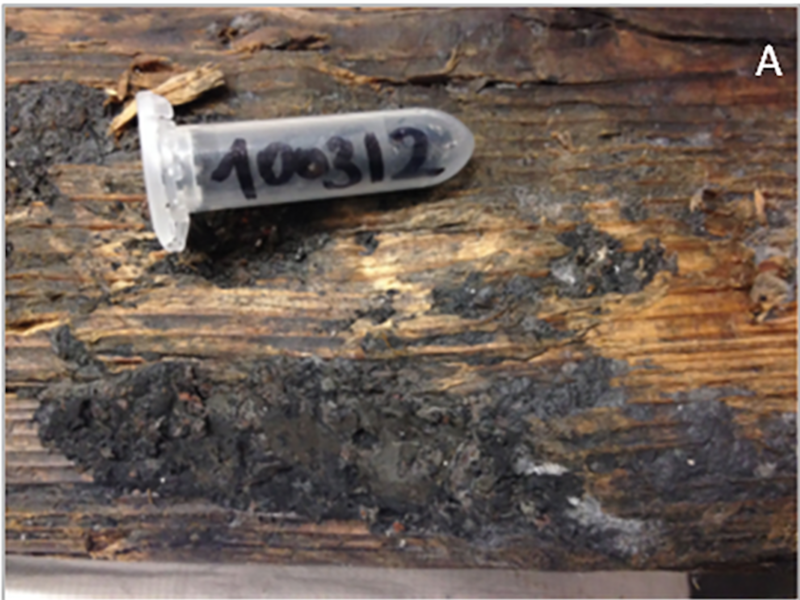 In addition, PCRs were performed directly on DNA extracted from the wood scrapings, and amplicons were analyzed using DGGE and sequencing of clone libraries. The 26 fungal isolates were affiliated with the phyla Ascomycota and Basidiomycota. Of these, Phialosimplex spp. recovered on media containing 10% NaCl, were the most abundant. Some typical cellulose degraders, namely Stachybotrys spp. and Cladosporium spp. were detected as well. The 59 bacterial strains belonged to Proteobacteria (mainly Halovibrio), Firmicutes (Marinococcus), and Actinobacteria. Twelve archaeal strains were cultured as well including Halococcus and Halorubrum. As with the fungi, most bacterial and archaeal isolates were found on media containing medium to high salt concentrations, up to 20%. Culture-independent sequence analysis of small clone libraries complemented the cultivation findings, detecting some additional uncultivable archaea. Based on the presence of the cbh-I gene or close similarity to strains with cellulolytic capabilities, many of the microorganisms cultured from the prehistoric staircase are believed to be capable of cellulose degradation. The results clearly showed the presence of some cellulose degraders that may become active if the requirements for growth and the environmental conditions turn suitable; therefore, these microorganisms must be regarded as a threat to the wood. Based on these observations, the Vienna museum experts decided to dry the staircase and ship it back to Hallstatt, where it is now on permanent display in a protective chamber. And the story has a happy ending! The staircase is separated from the visitors by an airtight transparent foil, and is stored by constant conditions: 8—9°C and 69—72% relative humidity. The climate in the showcase, and in the visitor area is permanently monitored by several measuring sensors. Until July 2015 no fungal mycelia could be observed on the staircase.